Springtime isn't boring...so why should your soup be boring? This one isn't! Great flavor and good for you! 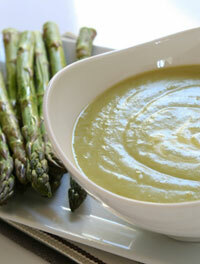 Asparagus and scallion soup is an excellent way to start springtime right! Spring's bounty is at its best when it comes to asparagus! Toss in a few other things like leeks, scallions and beans and you're talking extra good! Lots of fiber and protein in the beans and asparagus is a good source of vitamins A and C as well as thiamin. Eat healthy, eat smart! The health benefits of asparagus cannot be overstated! There are only about 43 calories in 1 cup of boiled asparagus and zero cholesterol. It is low in sodium as well. Asparagus is an excellent source of Vitamins C, K, A and B folate. There are also other B vitamins in asparagus in lesser amounts such as: B1, B2, B3 and B6. Some of the other health benefits of eating asparagus are that it provides dietary fiber as well as the following minerals: copper, phosphorus, manganese and potassium and also contains a fair amount of protein. So this asparagus and scallion soup not only tastes great but it is good for you too.Try this delicious springtime favorite soon - asparagus and scallion soup yum! 1. If using garnish, place almonds in large saucepan over medium heat. Toast nuts until golden, shaking pan occasionally to prevent burning, about 5-6 minutes. Transfer nuts to paper towel and set aside. 2. In same pan, heat oil over medium heat. Add leeks and 4 chopped scallions. Cook, stirring occasionally, until tender, about 5-6 minutes. Add broth, thyme, salt and pepper, and bring to boil. Add asparagus and beans. 3. Bring back to boil, then immediately reduce heat and simmer, partially covered, until vegetables are soft, 12-15 minutes. Remove from heat and cool slightly. 4. Purée soup in blender (or use immersion blender in pan) until smooth. Pour back into saucepan over medium heat. Heat through. Ladle into serving bowls. Garnish with toasted almonds and remaining scallions. *For a creamier soup, use the two small potatoes. Per serving: 146 calories, 3g total fat (<1g saturated fat), 24g carbohydrate, 9g protein, 5g dietary fiber, 304mg sodium.